The power of standardization. The acquisition of B&R Automation by ABB did not come as a surprise. B&R Automation Studio suite is following the OPC UA standard. This decision to implement the OPC communication protocol at the very lowest level of their PLC & HMI compenents surely played a part in their recent buy-out by the ABB Group. EATOPS has been following the same approach and complies with OPC Unified Architecture for the same practical reasons. 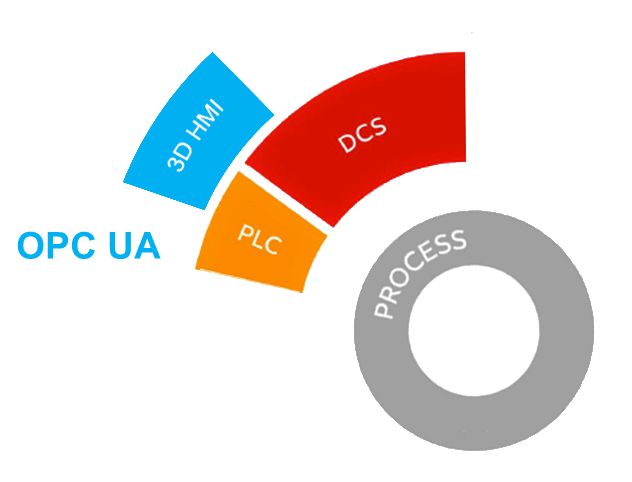 An open-standard between the PLC and the HMI leads to a stronger architecture leaving the PLC is its role of 'process logic controller' taking care of the logic, and the HMI in its role of 'human machine interface'. The HMI remains a slave of the PLC which means that several HMI modules can inherit the alarm & sensor values directly from the PLC. The #RIVOPS overview panels are fully compatible with the #AutomationStudio Suite. Some more #3DSCADA overview panels will come-out from EATOPS production line during the year following that same OPC implementation.